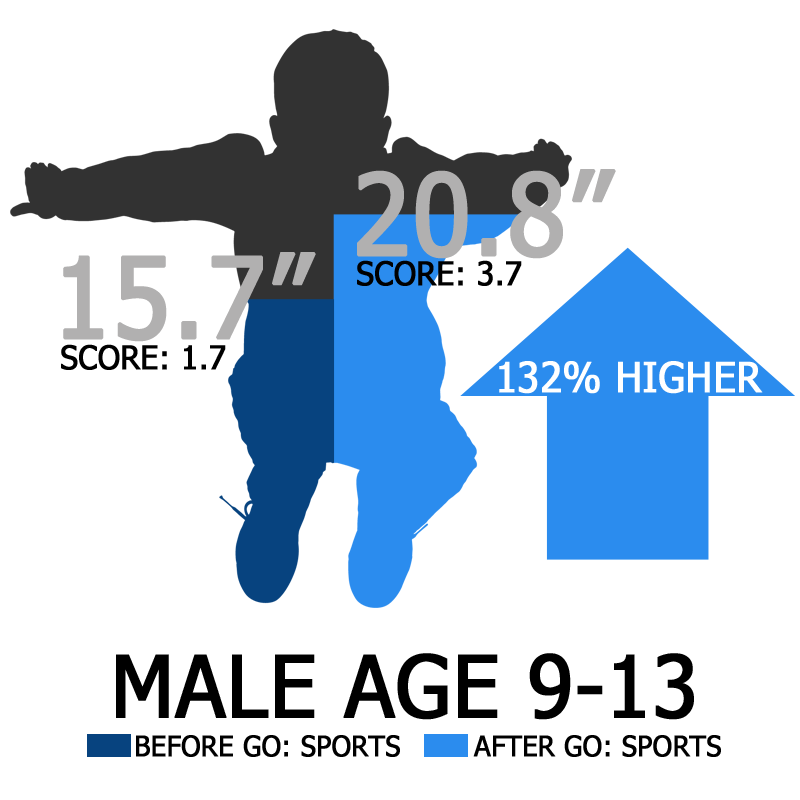 We can double your athletic score* – we will need an accurate determination of where you are now. To get where you want to go, you need to have a precise measurement of where you are beginning, and know what you need to do to make improvements. If you want to know what the athlete needs to be successful, you need to know what they are missing. You then can develop what is missing for your athlete’s success. 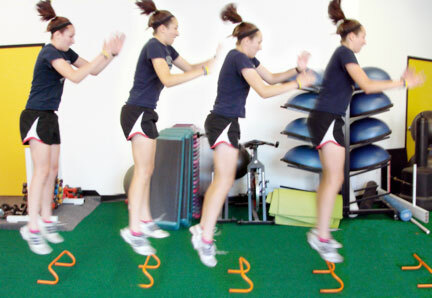 Our Athletic Functional Evaluation is unique to the Sports Performance world in Central-Ohio. It can show us, the parents and the athlete what the athlete needs to be more successful and safer in their sport. Most sports performance facilities are less concerned about becoming proficient at assessing an athlete’s physical ability, than they are about making numbers go up in their lifts. This is the reason why most sports performance places have little to no impact, or even a negative impact on athlete’s ability to perform well in their sports. 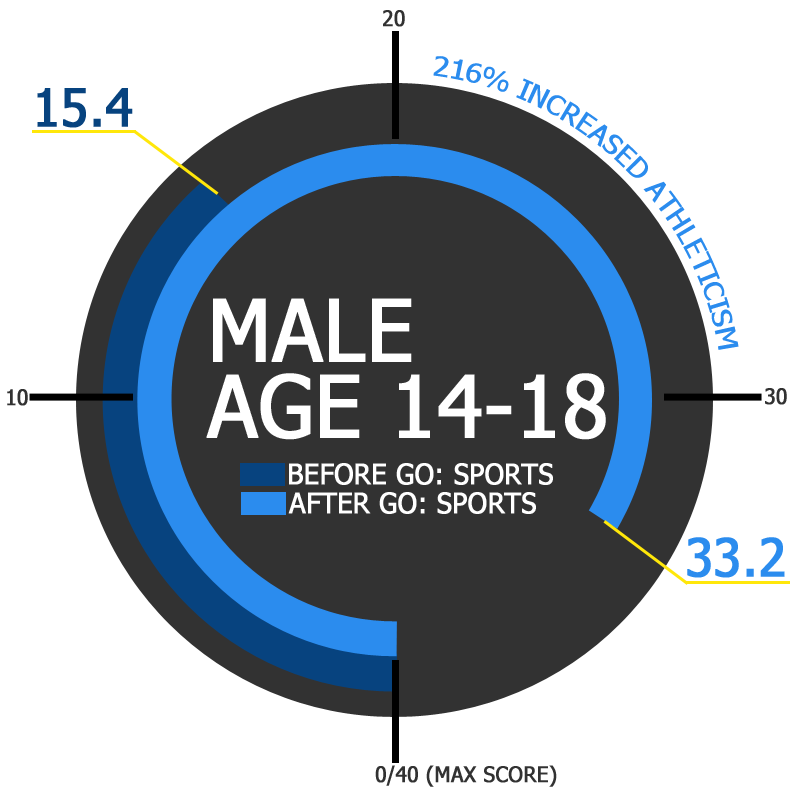 The GO: Sports model truly benefits the athletes in a way that allows them to play their sports better, look better, feel better and have more confidence. You might be a good athlete to begin with, but if we can identify anything holding you back, build those things, and improve your natural skills, we will help you go further than you may have thought possible. Some good athletes are surprised when they do an Evaluation and get their results, and find out they have a few limitations that they were not aware of. We liken this to having buildings made out of different materials. We once built everything out of thatch, then came brick, and then came steel. Each one was better than the material before. 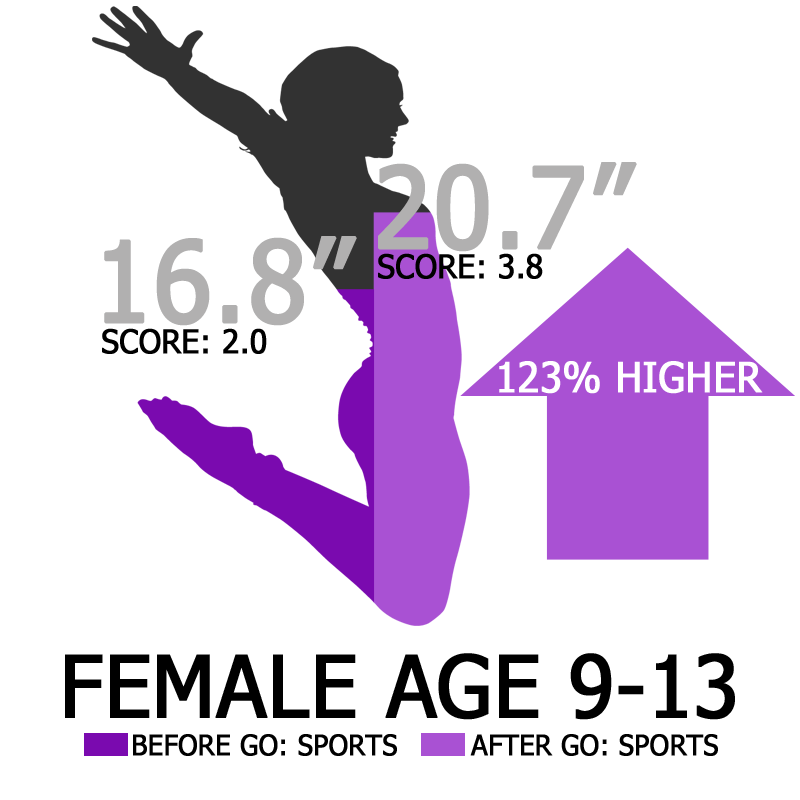 The Evaluation is scientifically designed tests. 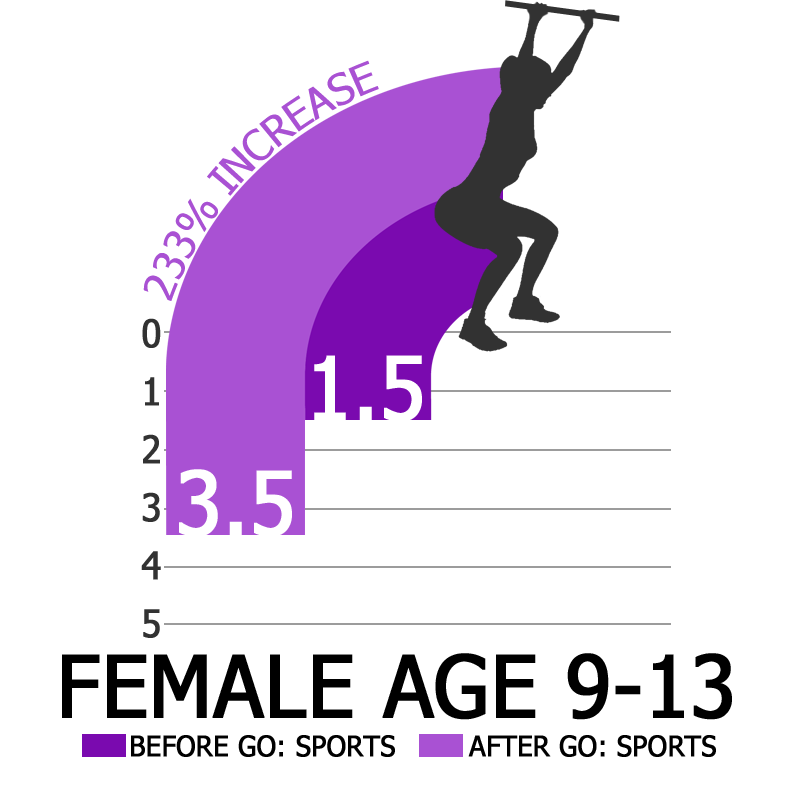 We then compare these tests to the top 50% of athletes in the U.S. to give the athlete a ranking, based on age and gender. This helps us to place the athlete into the appropriate level for maximal training efficiency. 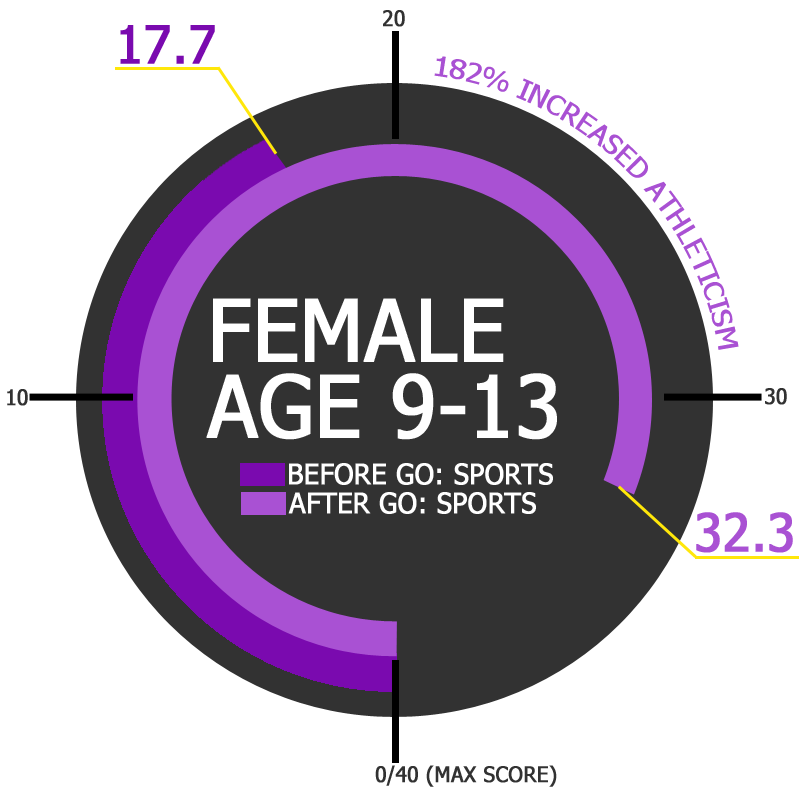 This pinpoint approach to training allows us to double the average youth’s athleticism in 9 months! * If you are curious as to what the tests are, and how they determine the success of your athlete, look below at our evaluation & results. * Training 3 or times per week for 9 months. Your athlete’s running mechanics will be assessed during the running analysis. According to what our trained coaches see here, we can predict where your athlete’s strength, flexibility and technical deficiencies lie. 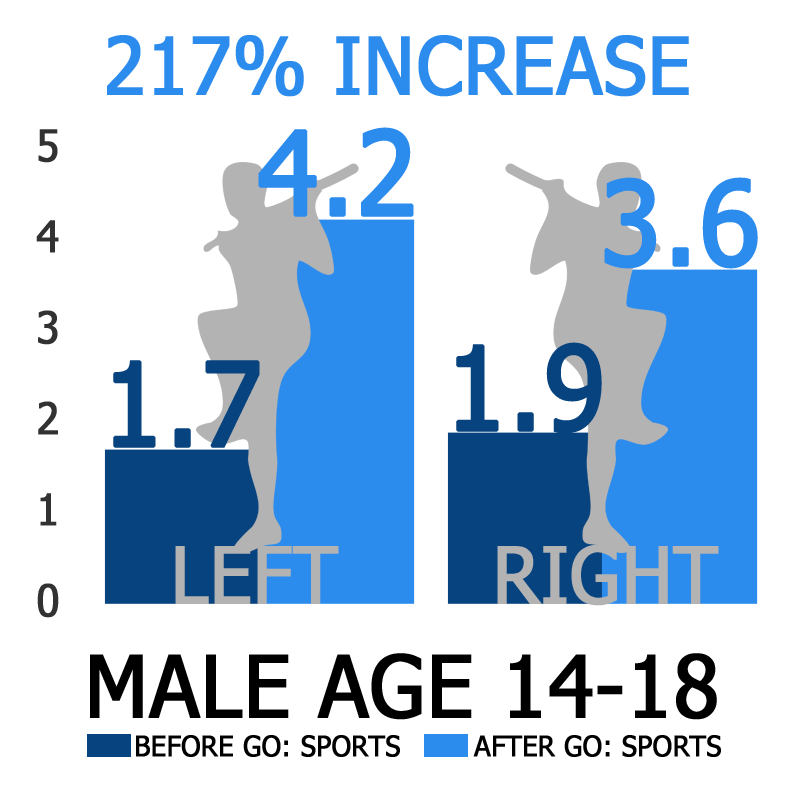 Commonly found technical deficiencies are errors in the arm and leg mechanics as well as head and torso position. If these errors are found, the coach will be better able to recommend certain styles of training sessions for your athlete. This test is a powerful measurement of relative body strength. 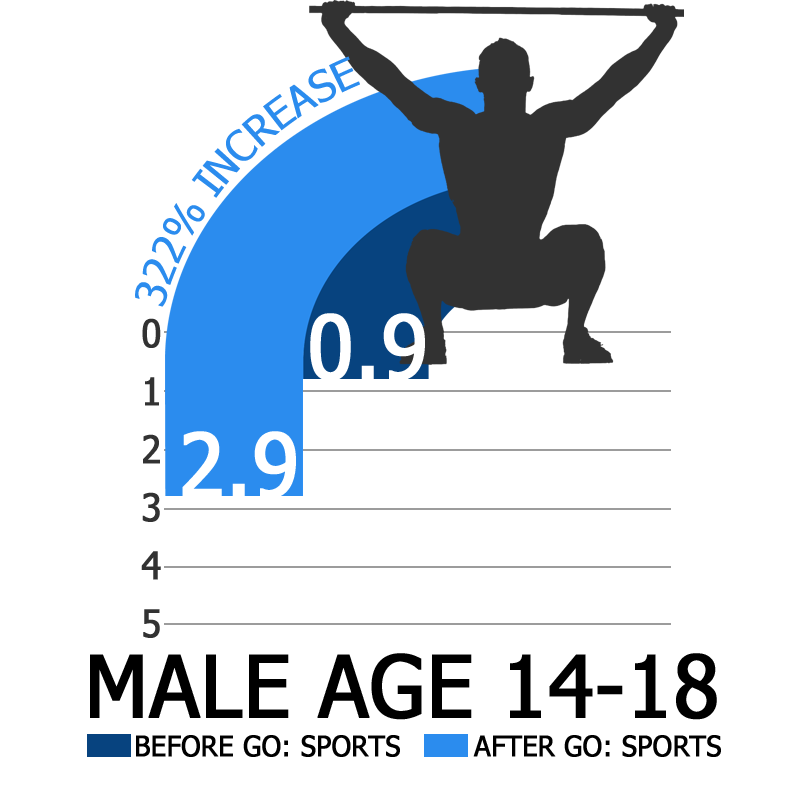 We have found that the number of chin ups performed is related to running speed and agility. 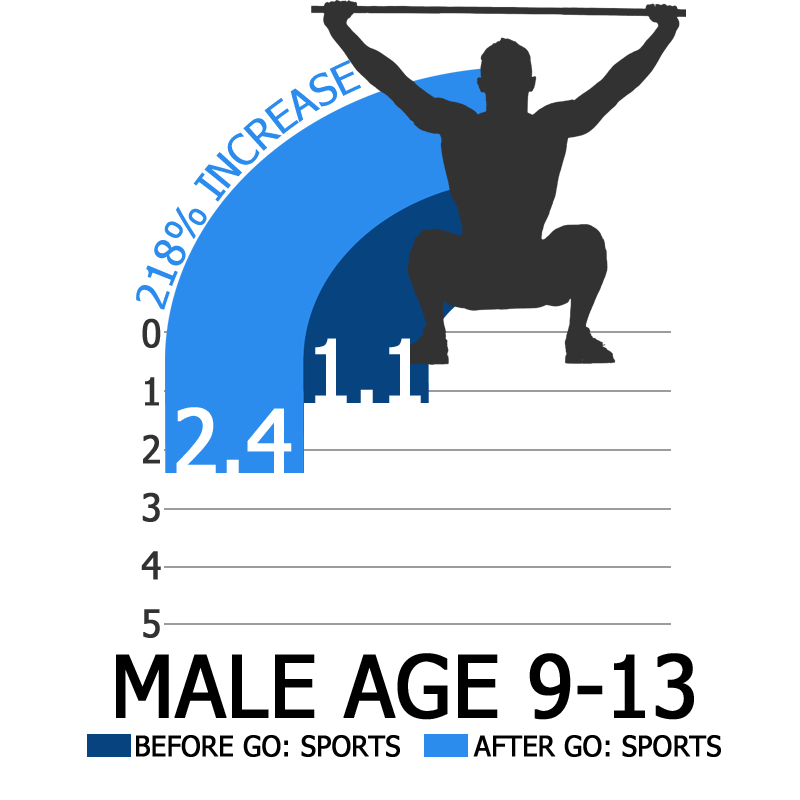 The vertical leap is a much better indication of the athlete’s ability to generate power in a sports performance setting. Power is what’s used in most sports over 95% of the time. Placing 400 pounds on an athlete’s back and having them squat has no carryover to any sport other than power-lifting. We also use electronic testing for this test. 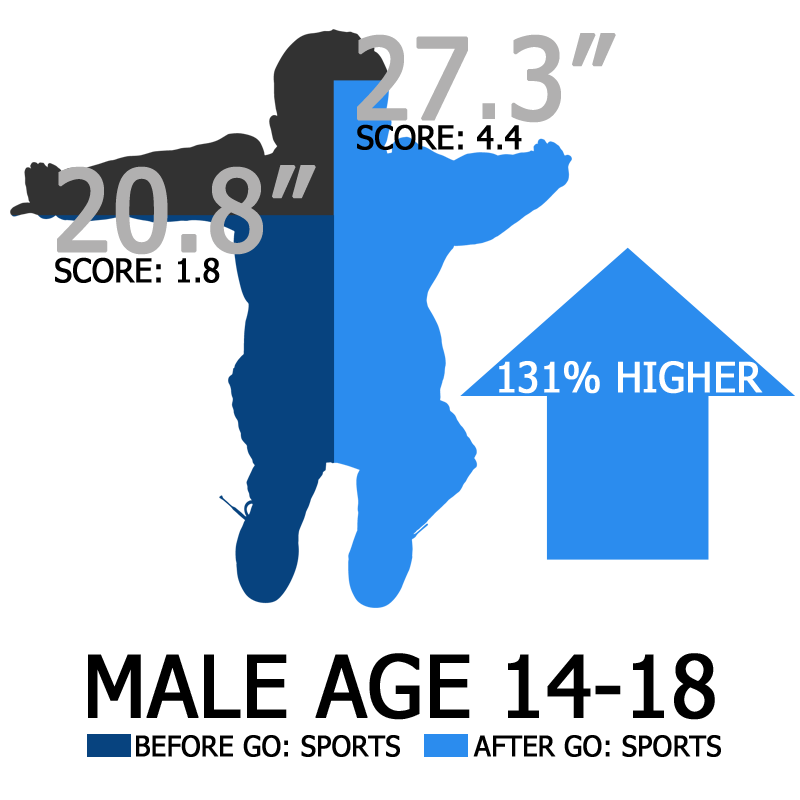 Using other testing methods, we have seen athletes able to add between 8” and 12” to their vertical leap before they ever leave the ground. 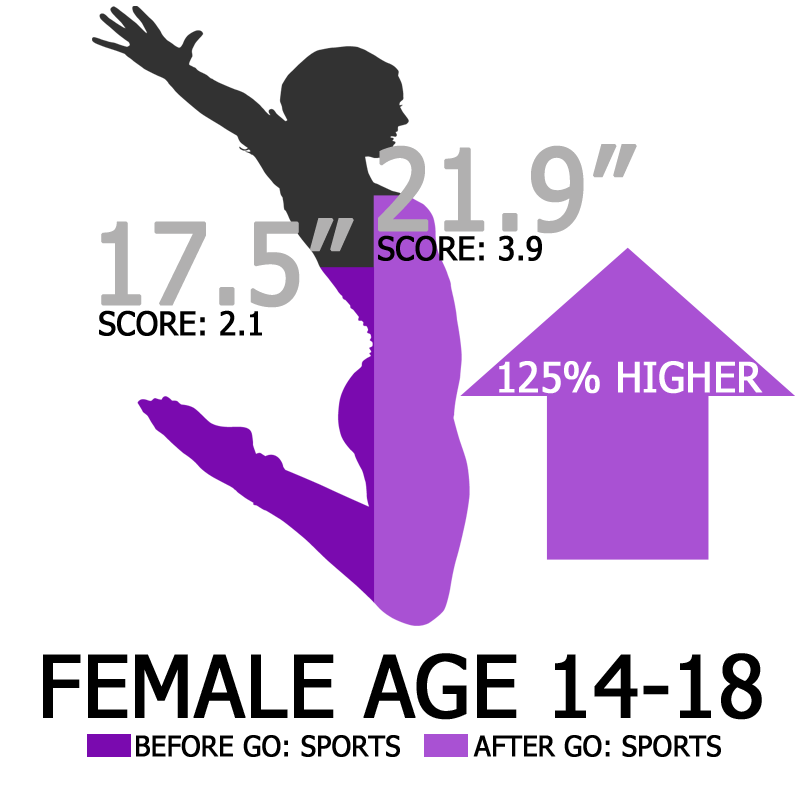 This is the reason we have gone with very accurate electric testing over with other vertical leap tests. Don’t be fooled by looking for 40” jumps. With GO: Sports, when you get your numbers, you will know they are accurate, and when we show you your improvement, you will know they are real. 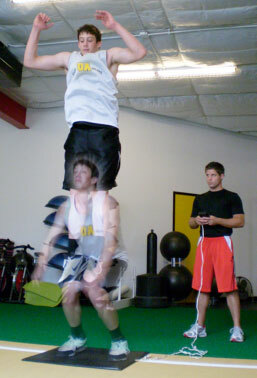 This is a test that measures the amount of force your athlete can produce in the horizontal direction into the ground. 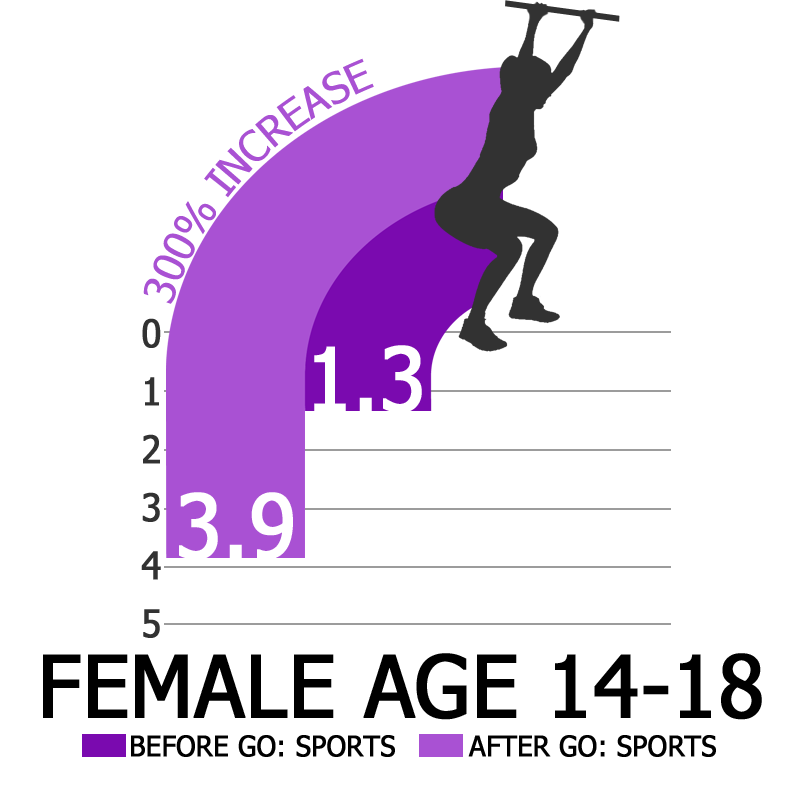 This measure is directly correlated with running speed. This is a lateral agility test that measures your athlete’s ability to start, stop and change direction. 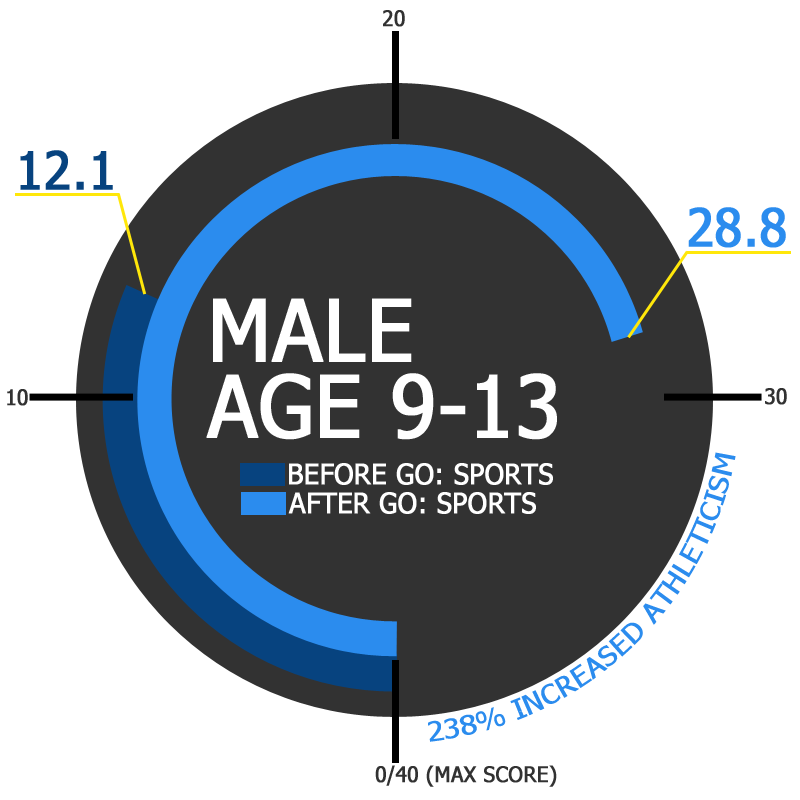 According to your athlete’s time, the coach will learn about your athlete’s lateral movement technique. The next test is the One-Leg Hurdle Step-Over test and is also unique to GO: Sports. 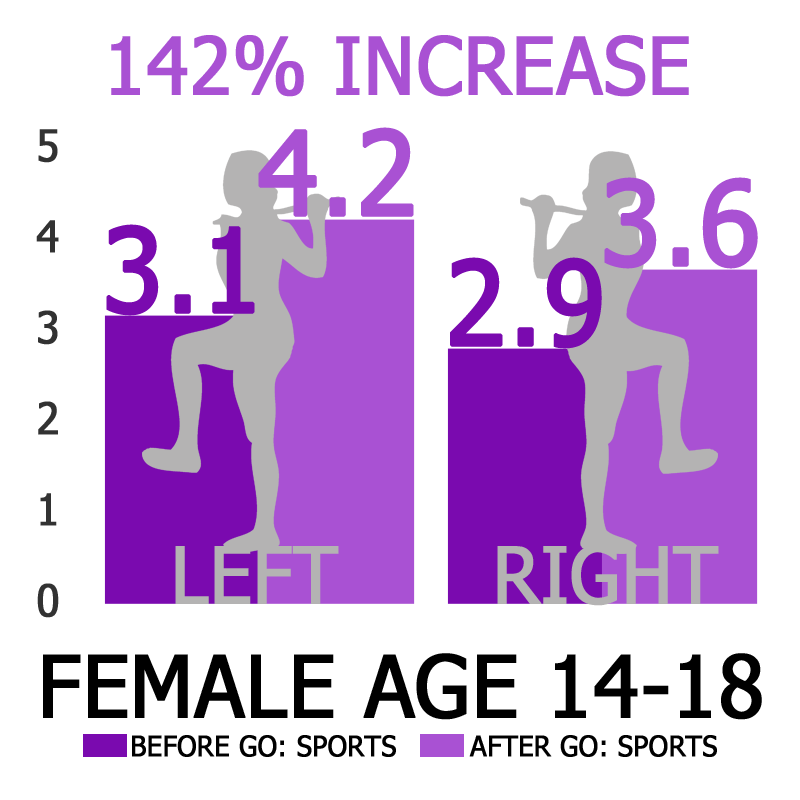 This functional movement test assesses the athlete’s ability to stabilize the ankle, knee, hip, core and shoulder while standing on one leg. The one leg step over test allows us to see if the athlete has any instability problems with the hip, hip flexors, or extensor’s. It also checks on the alignment of the athlete for balance. 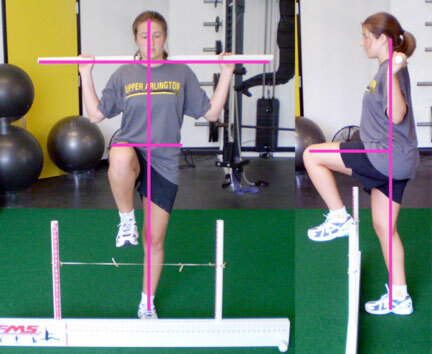 Does the athlete have the ability to stabilize the hip and shoulder while standing on one leg. 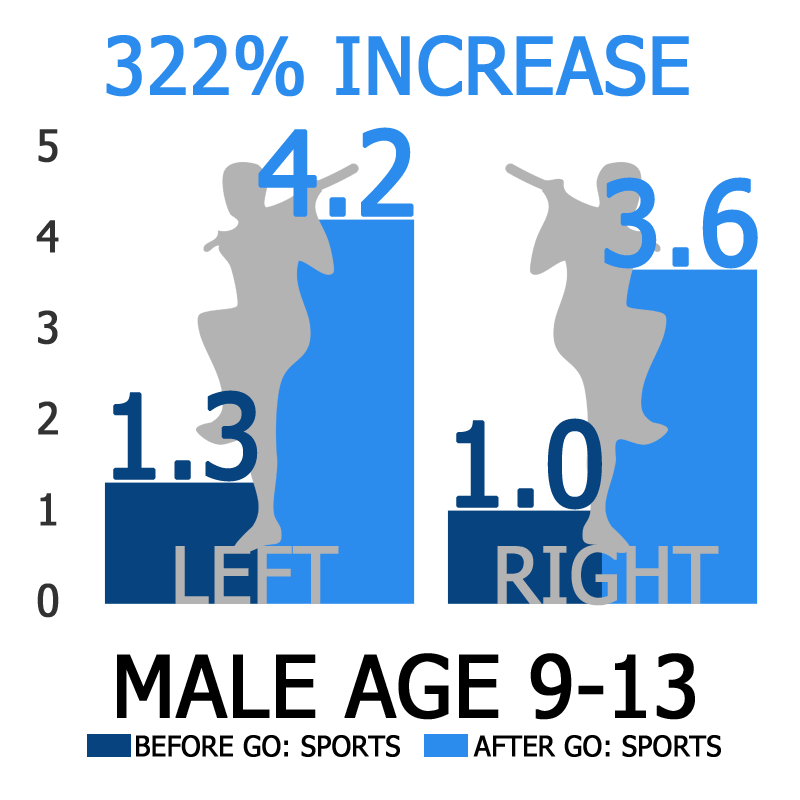 Often times after this test we can see major discrepancies between right-handed and left-handed athletes. No other test is going to show this as blatantly as this one does. GO: Sports is the only training facility to use this test to assess athletes. Balance, stability, coordination, and athleticism are critical because most sports are played with one leg dominant or in action, and one arm dominant or moving. However, most other programs never assess or even train athletes with one arm or one leg. Other programs off-season training promotes only two arm and two leg movements, thus making the athlete more uncoordinated and less athletic before their season. 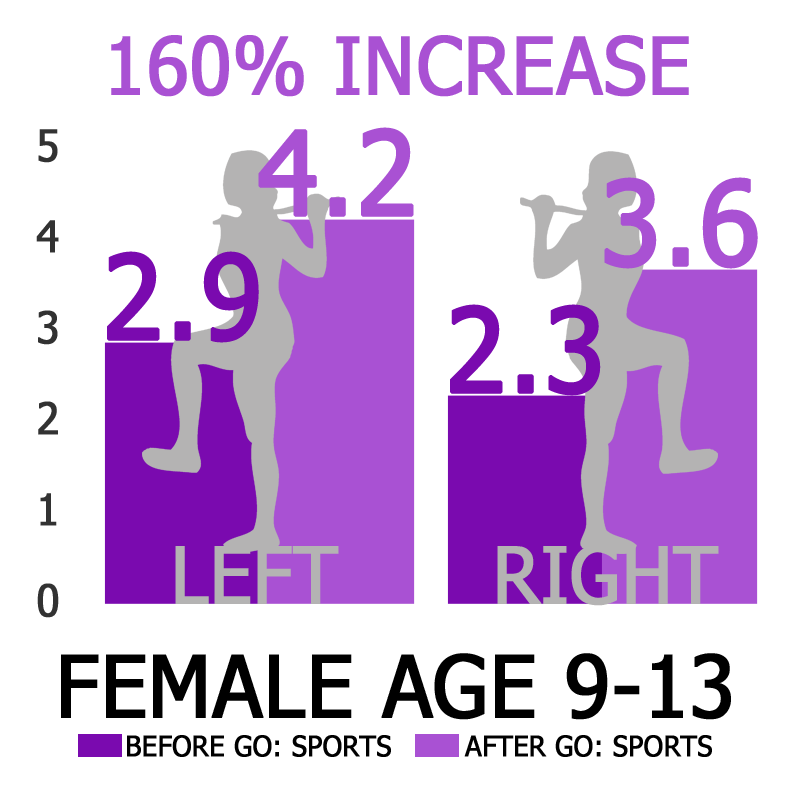 Whether the athlete has a balanced squat, left and right, forward and back. How the Hamstrings, Glutes and Lower-back musculature works together. How Flexible the Hamstrings, Glutes and Calves are. How the Shoulders and Thoracic Spine work together. Whether the athlete has problems aligning their feet, knees and hips in an athletic and safe position. Whether the athlete has proper range of motion in their ankles, knees, hips, and thoracic region of the upper back. We use this test to look at how well the athlete functions and to see what range of motion can go through. We are not just concerned about flexibility; we are also concerned about the joints operating in a proper range of motion and in the way that they’re supposed to. Most people think of muscles by themselves, at GO: Sports we think of the muscles in the way that they function together, which is, making joints move correctly. This test is so important, that only 2 coaches have been trained enough at GO: Sports to do it accurately and again, this test is unique to GO: Sports.